Arab riots in Jaffa resume days after man shot and killed while attacking police. 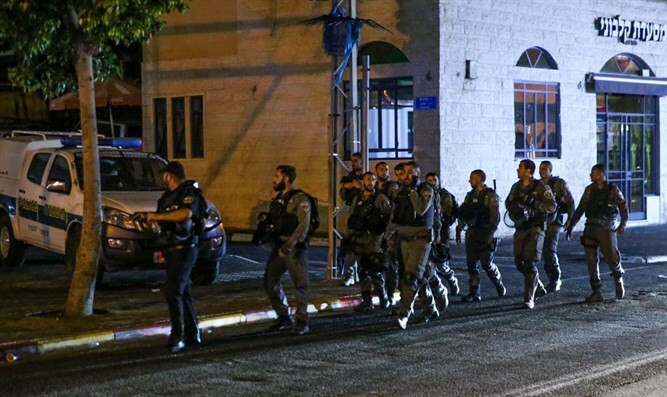 Hundreds of Israeli Arabs rioted in the Jaffa section of Tel Aviv-Jaffa Thursday evening, after an Arab man wanted in connection with a shooting was arrested. According to police, some 300 rioters clashed with officers, throwing stones and lighting tires and dumpsters on fire in protest of the arrest of the brother of Mahdi Saadi, who was killed last week after attacking officers in Jaffa. The 20-year old suspect allegedly planned past attacks on police over the past week. After police took the suspect into custody, dozens of Arab locals attacked police on Yefet Street. The clashes quickly escalated as hundreds of Arab youths gathered in Yefet Street, throwing stones at officers, smashing store fronts, and setting up makeshift roadblocks with burning tires and dumpsters. A police spokesperson said the incident began as an illegal demonstration at roughly 8:30 p.m., but by 10:30 had devolved into a full-fledged riot. At least two rioters have been arrested. On Saturday, hundreds of Arabs rioted in Jaffa during the funeral of Mahdi Saadi. Two Israeli journalists covering the funeral were attacked by what they described as a “lynch mob”.